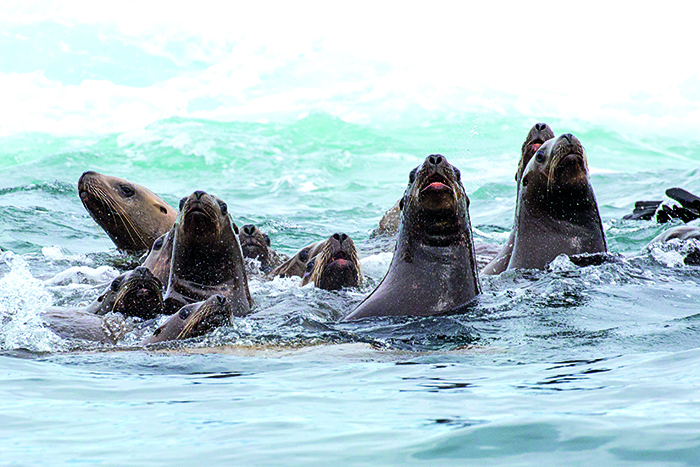 We’re the paparazzi of the ocean – cameras, mobiles and zoom lenses primed for an elusive shot of the marine megastar. Poised for action on our small boat, like troops awaiting a signal, we are silent and the sea is still. Suddenly, a huge, sonorous, almost prehistoric sigh punctures the air and someone shouts: “There’s the blow – she’s straight ahead.” We swing round en masse to witness 15 feet of water shoot into the air, followed by a giant expanse of black as 40 feet of whale arches in slow motion above the waves. Breathtaking, tantalising and so graceful it makes me want to cry. I don’t get my photo of the humpback whale; in the end I don’t even try. I want to witness the magnitude of this vast creature with my own eyes, rather than fumbling behind my iPhone for a decent shot. In the past 20 years I’ve been fortunate to notch up 66 cruises and have seen dolphins, seals, otters and even baby sharks in the wild, but never an actual whale… until today. So it’s a mighty tick at the top of my wish list, and I’m now declaring this Silversea cruise, my first, to be an unprecedented success, whatever follows. We do encounter some rough weather on our first day of sailing in Alaska, but Silver Shadow remains steady in the open seas – the only rocking and rolling on board is reserved for the late-night 1960s disco. I spend a lot of time in my stateroom – not because I feel unable to move around the ship, but because the cabins are spacious and very comfortable, even at base level. Suites come in eight categories, all with ocean views, stylish and sophisticated in design, with muted colours and imaginative lighting; the smallest enjoying generous picture windows and the largest substantial verandas. I’m in a mini suite and can curtain off the lounge area from the bedroom (very useful if one passenger likes to burn the midnight oil while their partner enjoys their beauty sleep). The TV pivots to serve both areas, though I don’t watch much TV in bed as the Italian luxury mattress, dressed with silken Pratesi linen, proves an instant sedative. Plus there’s a ‘pillow menu’ with nine different choices, and after opting for the super-soft Aqua Plush (complete with hidden lavender sachet) there’s no chance of finishing a page of my book, let alone watching one of the many films on offer. I have a sizeable walk-in wardrobe and one of the best bathrooms I have ever seen on a ship: a contemporary granite and marble sanctuary complete with bath and separate shower, his-and-hers sinks, bathrobes, and a choice of three different brands of toiletries: Bulgari, Ortigia and a smart German make I haven’t even heard of. Add to that personalised stationery, a complimentary mini-bar stocked with my favourite tipples (including as much Champagne as I fancy) and a white-gloved butler, Joselyn, who delivers tummy-soothing crystalised ginger during rough seas (though luckily it’s like a millpond after the first day) and even offers his services in packing my case – now that’s a first. Dining on board is flexible, and 24-hour All Around Dining is on offer en suite, with stylish silver service and at no extra charge. In addition to the room service menu, when The Restaurant is open it’s possible to order from that day’s extensive choice of dishes, too. I particularly enjoyed this main restaurant – all gleaming chandeliers, parquet floors and with a distinguished Art Deco feel. With a ratio of 382 passengers to 302 crew, there is always a waiter hovering to top up your glass, and efforts are made to remember names and individual drinks preferences. The food overall is very good, with fresh, locally sourced ingredients used wherever possible. Healthy accompaniments such as chia and flax seeds, and every nut imaginable feature at the breakfast buffet in La Terrazza. Sushi and sashimi are always available at lunchtimes, along with hot dishes and salads. In the evenings the buffet section is closed and La Terrazza gets a mini-makeover to become a hugely popular Italian restaurant serving signature handmade pasta and sensational pizzas – and as Silversea is family-owned by Italians, these dishes are very much a highlight. If you want to splash out a little you can eat in Le Champagne, the most romantic venue on board featuring culinary creations by the esteemed Master Chefs of Relais & Châteaux, with fine wines complementing each of the regional French dishes. The edible gold leaf risotto is a sure-fire crowd puller, and even though Le Champagne carries a supplement it is always booked out, so be sure to reserve a table as early as possible – and do the same for La Terrazza in the evenings. The other restaurant that warrants an evening reservation is The Grill. Relaxed and casual at all times, by day it is an alfresco poolside haunt serving burgers, fresh fish and salads. But the real fun begins at night, when your entrée arrives on a heated volcanic stone and you continue to cook it to your liking. The steaks are meltingly soft, and I can highly recommend a surf ‘n’ turf combo of filet mignon with enormous Madagascar prawns, masquerading as lobsters. Even if it’s a chilly evening it’s still a great experience as you are cosily wrapped up in a blanket beneath judiciously placed overhead heaters. a fleece, waterproof jacket and even a scarf, especially on a boat trip. 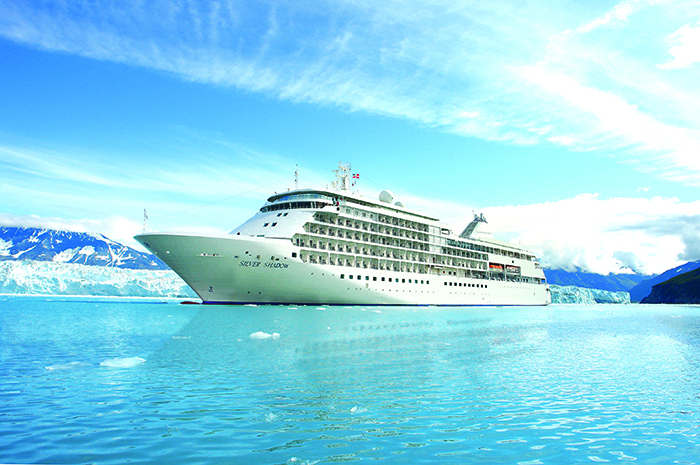 Silversea is renowned for its shore excursions, and the programme was incredibly comprehensive. 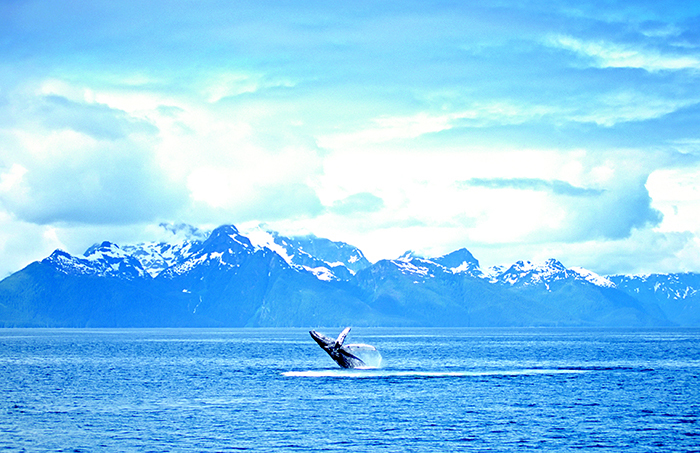 As well as whale watching (which incidentally was on board a small eco vessel that also tracked crab pots and the local seal colony), I could have enjoyed rainforest hikes, sea kayaking, bicycle rides, salmon fishing, ocean rafting, dog-sledding, crab feasts, helicopter flights, zip-lining, horse adventures, a lumberjack show and a glacier walkabout – and the list goes on. 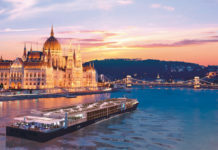 Much is included in this cruise (notably gratuities and all drinks, except for Connoisseurs’ List beverages) though excursions carry an additional cost. Whale watching seems to be pretty much guaranteed as refunds are issued if there are no sightings of this magnificent mammal (which apparently never happens) and another extraordinary trip is the White Pass vintage steam train that weaves its way along the famed Yukon Route all the way to Canada. Perhaps my most surprising excursion was the Skagway Streetcar City tour, the staging ground of the incredible Klondike Gold Rush. Travelling around the most important points of interest in a yellow streetcar, I had the benefit of a 90-minute history lesson from the best guide I have ever encountered. A cross between Bette Midler and a firework, Nikki Bunting is blessed with enviable comic timing and should at the very least have her own TV series. If you’re planning to visit Skagway, be sure to book a tour with her. 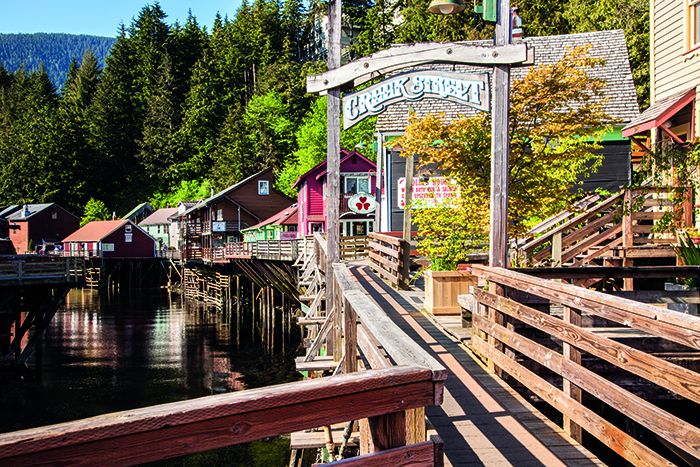 Most of our ports of call – Juneau, Sitka, Ketchikan as well as Skagway, have retained their natural beauty and frontier town feel, but have sadly also become tourist traps. An array of discount jewellery outlets and souvenir shops line the boardwalks, making shore excursions into the real Alaska more of a necessity than an extra treat. One onboard highlight was cruising the Hubbard Glacier on our second day. The distinct advantage of a smaller ship is that it’s able to squeeze into places the big boys just can’t manage. The entire ship celebrated the event from the observation lounge, juggling hot drinks with cameras and phones while marvelling at how close the captain steered us to this vast river of vibrant blue ice. 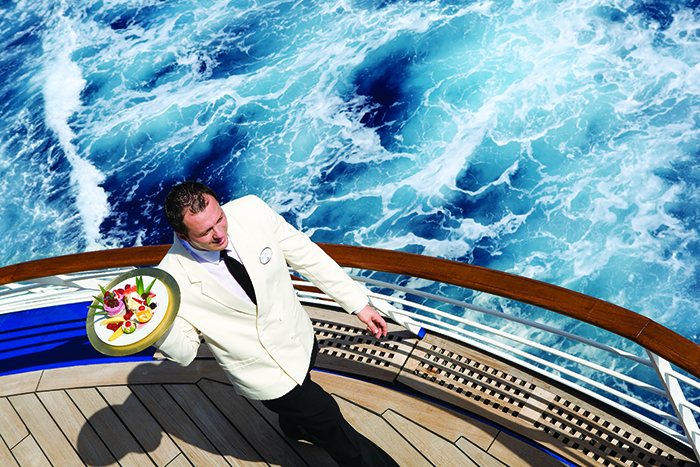 The mantra for this cruise line is “relish, relax, recharge, repeat’’. All of which is easy to do on Silver Shadow. In fact, it’s such a good idea I think it might now replace “see a whale” at the top of my wish list. GETTING THERE: A seven-day cruise from Seward (Anchorage) to Vancouver, departing on 24 May 2018, starts at £3,100pp based on double occupancy of a Vista Suite, cruise only. 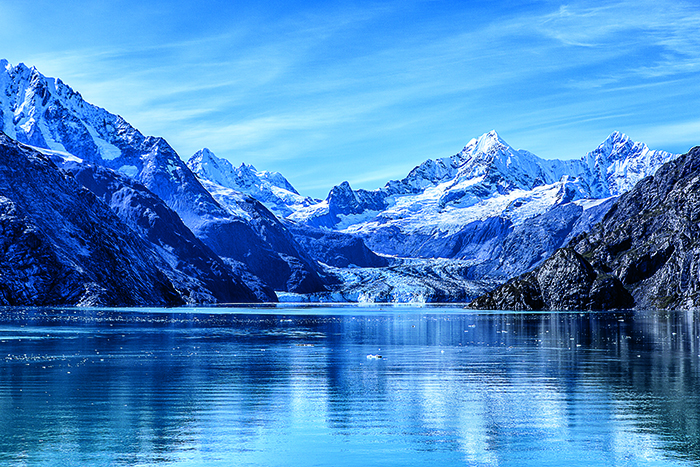 Ports of call include Juneau, Skagway, Sitka and Ketchikan. 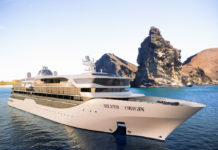 The fare is inclusive of butler service, multiple dining options, beverages in-suite and throughout the ship, onboard entertainment and lectures, complimentary transport into town at most ports, wifi and gratuities (0207 340 0700; silversea.com).